This is an anthology of tales both fiction and fantasy. Some are shorts, some are excerpts. All are about people living life as it is handed to them. Sometimes people make the best of an unusual situation. Sometimes people take the reins of their lives and things go horribly wrong. But strength is found in those who have the courage to look life in the eye... Don't Blink! 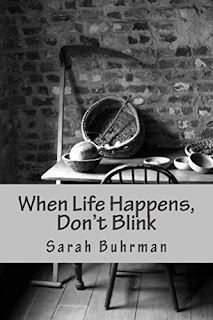 I won an e-book copy of When Life Happens, Don't Blink on Facebook and although short stories aren't really my cup of tea, I picked it up when I was looking for a quick read. It was indeed quick, probably only around 30 minutes, and the stories are quite varied and very unusual. There are 7 short stories, with 3 of them being excerpts. I really liked the opening story, Sugar Daddy, and the penultimate story, Hell on Earth, which couldn't be more different. In Sugar Daddy we take a sneak peak at the unconventional relationship between Janice and John. Everyone will take something different from this story, but for me it was a case of 'you don't know what you've got til it's gone' and how sad it is when you don't express your true emotions. Fast forward from Sugar Daddy to Hell on Earth and we meet an even more unconventional mixed-race family - mixed race being part demon, part human. Although you could draw a deeper meaning from the mixed-race, I found it fun and lighthearted, showing that one person's 'hell' can be another person's 'heaven'. A quirky collection, When Life Happens, Don't Blink, is worth picking up if you're looking for something a little bit different. I think the author has some very diverse writing skills and I wouldn't hesitate to pick up another piece of her work.